The International Basketball Association’s ban on religious headwear like turbans, hijabs, and yarmulkes worn by some Sikh, Muslim, and Jewish basketball players is an “extremely disrespectful” way of forcing players to choose between their favorite sport and their religion, one of the Muslim women fighting to overturn the ban told ThinkProgress this week. Indira Kaljo, a Bosnian-American Muslim who played college basketball for Tulane University, began challenging FIBA’s ban on religious headwear this year, when she decided she wanted to wear a hijab during games but could not if she wanted to play professionally in Europe. Kaljo did not wear the hijab while playing at Tulane or during a year of professional ball in Ireland. But after deciding to adhere more closely to her faith, Kaljo took her story to the Council on American-Islamic Relations in an effort to pressure FIBA into changing its policy. She played covered in an American summer league this year and does not want to return to Europe if she cannot wear a hijab. The policy has drawn international criticism in the form of official complaints from the Turkish basketball federation, social media movements, online petitions, and even a letter from American lawmakers after multiple Indian Sikh players were told they could not wear traditional religious turbans during games in different Asian federation tournaments. It has been a focus too of Muslim groups and women players who have challenged it, including the women’s team from the Maldives, which withdrew from an under-18 Asian tournament this month when officials refused to let players wear hijabs during games. FIBA was scheduled to review the policy during executive meetings in Spain this week before the start of the men’s basketball World Cup. But it announced Thursday that it would indefinitely delay its review, meaning the ban will remain in place. FIBA has previously defended the policy as necessary for the safety of its athletes, but there is little evidence that hijabs or turbans are a safety issue. FIFA, the international soccer federation, fully overturned its ban on headwear this year after conducting a two-year preliminary trial to monitor for safety issues. The International Olympic Commitee and International Judo Federation reached an agreement to allow a Saudi judoist to wear a hijab during the London Olympics in 2012, and in the U.S., the NCAA has allowed basketball players to wear hijabs and turbans during competition without incident. Kaljo said that she actually found playing in a hijab as less of nuisance for her opponents, given that her “pretty long hair” was held down instead of “flying all over the place.” If FIBA is truly worried about injuries, Kaljo said, it could follow in FIFA’s footsteps and mandate hijabs that come off easily if tugged. Kaljo simply doesn’t buy the safety claims as a legitimate reason for the ban. FIBA’s delay, meanwhile, has only sparked another round of calls for change. American Reps. Joe Crowley (D) and Ami Bera (D), the authors of a letter to FIBA from 20 members of Congress, issued a statement blasting the decision to delay the review. 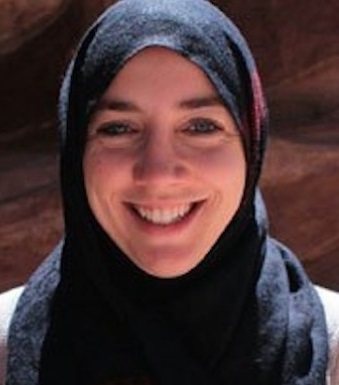 This entry was posted in Hijab, Resisting Islamophobia, USA, Women by Bob Pitt. Bookmark the permalink.